*looks around* Uhm.....does anything look different to anyone else?? *shrugs* Now then, where's that cup of tea I asked for? Like home, except someone dug it up, foundation and all and transported by truck to the other side of town and planted orange bushes in the side garden! I seem to have skinned my knee *looks at hole in bloody knickers and socks*. Unfortunately, the container with the first aid kit doesn't seem to have come with us. Are we still on the same planet, or do we appear to have been transported completely elsewhere? How exciting! Wait a minute! Where the hell am I? This is not where I was going. Oh well, it seems like a nice enough place and the people are familiar. I'll hang around for a while and see what comes up. Well, just be thankful that you've missed the squirrels and coffee explosions. It was getting pretty messy around here. Fear not, this robotic butler has survived too.......and he.....uhm........Ahhhhh! 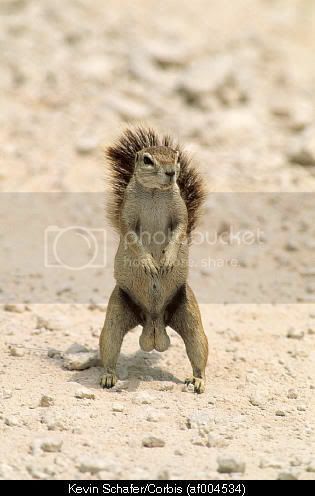 Well it seems he's brought a couple of those squirrels as pets! ... Oh I do hope it's not a breeding pair! *sees something sticking out from under a big pile of stuff on the floor* OOHHH!!! It looks like the coffee machine has survived too!! *happily pours a nice steaming cup of tea* Ahhhhhhh!...... Thats better! Or that one needs more explosive squirrels in one's diet. Siliconous Skumins wrote: Fear not, this robotic butler has survived too.......and he.....uhm........Ahhhhh! Well it seems he's brought a couple of those squirrels as pets! ... Oh I do hope it's not a breeding pair! If it's this squirrel, I fear all is lost! Yes, one can only imagine the horror! Mind you, it doesn't look likely - he's allready at the booze, and he's nicked my pack of cigarettes! Dear lord! My vision has gone all orange! And the goggles...they do nothing to alleviate the problem! The rest of you hand over the brownies 'n beer and remove those goggles. You're not fit to fly! Thank you for the link, Stormfeather! I shall order several pairs immediately! Unfortunately, he has a habit of removing his drawers and attaching them to the tiny flagpole in the front yard. 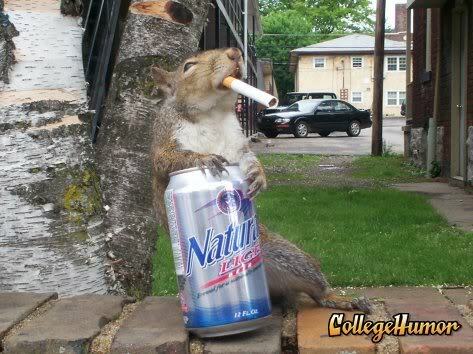 Thankfully, he does not smoke (like some other squirrels), else we would have all gone up in flames ages ago! Is this sort of thing going to happen every time we use the improbability drive? Not I. I never travel without a towel and mine is accounted for, thank you. Well, I have 43 towels, which I use in rotation. Everything seems somehow familiar... except the squirrels, I believe they were not there last time. We should eradicate them with some ravinous hedgehogs! Mrs. Sullivan wrote: Well, I have 43 towels, which I use in rotation. Perhaps we could use these to clean up the Squrrills that the Headgehogs miss? Oh.....well, I guess that's takes care of that, then...?!! KatarinaNavane wrote: Is this sort of thing going to happen every time we use the improbability drive?